Did you know that bay or laurel leaves come from the laurel tree? If that sounds familiar, laurel wreaths were used to crown winners in ancient Greece. The laurel tree originated in Asia Minor and the dried bay leaf is a go-to herb in Greek, Turkish and Mediterranean cooking. Bay leaves are used only to flavor a dish. Always remember to remove them from the food before serving because they’re difficult to digest and are very bitter to taste. Try to use the leaves whole as when they are broken or crushed the leaves become much more difficult to remove from your food. I use bay leaves sparingly as their flavor is strong and can easily overwhelm a dish. Tip to share – because I hate the idea of throwing away the little pieces of bay leaves left at the bottom of the jar but I also hate the idea of picking them all out of the finished dish, I now tie them up securely in a small piece of cheesecloth and use as I normally would in a recipe – problem solved! 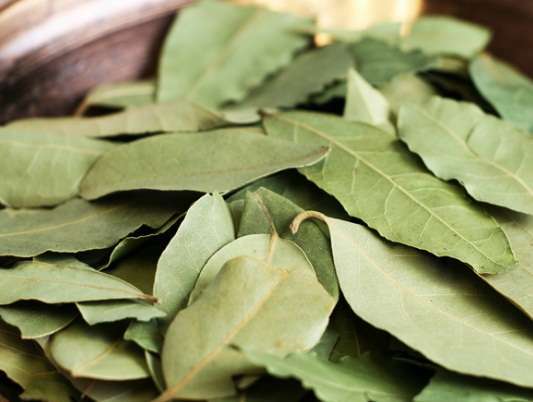 Varieties of bay leaves are usually differentiated by place of origin. If you haven’t already, I highly recommend you try the Turkish variety. I love the flavor of Turkish bay leaves. They add a much more subtle and delicately woody flavor to foods as opposed to the more readily available variety from California. I buy my Turkish bay leaves online at www.thespicehouse.com. Their spices are always fresh and excellent quality. Can’t tell you how many times I’ve gone online to place a quick order and gotten completely sidetracked by the pages and pages of exotic spices they offer. It’s worth a browse even if you don’t buy anything. Tip to share – mark the date on a piece of masking tape stuck to the bottom of the bottle or bag so that you don’t keep them for any longer than 6 months. 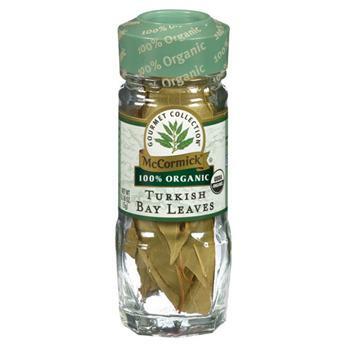 If you’d rather buy locally, McCormick makes a top tier line of spices that includes Turkish Bay leaves. They are not bad and available at most supermarkets. Just remember to look for the ‘use by’ date and make sure the label clearly reads “Turkish”. Many Greek households scatter dried bay leaves around the kitchen to keep away pantry and house flies. It’s a great way to reduce the chemicals you use in your home, get rid of annoying pests and have a lovely scent in the air all at the same time!